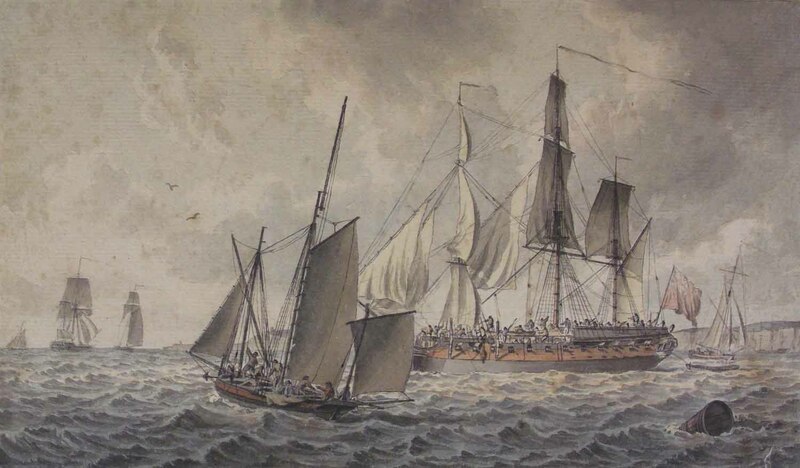 Frigate and Fishing Boats, John Cleveley the Elder, date unknown, Wikimedia Commons. Continuing on my John Cleveley the Elder kick, I dug up this piece from Wikimedia Commons. It is undated, but obviously must have been before Cleveley's death in 1777. The user who submitted this picture claims it is in the collection of the Mariners' Museum and Park, but their online catalog turns up nothing. The men int he fishing boat wear jackets of varying shades of brown. 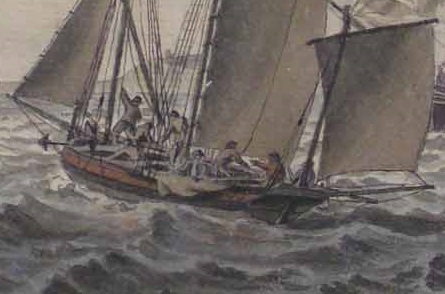 The Coxswain appears to be wearing red. The resolution is too low to be certain of much else, including their headgear. The only other detail is the fellow at the foremast who wears a pair of light blue or natural colored petticoat trousers. The men on the twenty four gun frigate are likewise nondescript. Blue and light colored jackets, indiscernible headgear, and too low of a resolution to say anything more. I hope to find some time to get down to the Mariners' Museum in the future, in part to see if this mysterious piece turns up. If you have any more information on Cleveley's painting, please let us know in the comments below!